In 1881 Peter C. Forrester from San Francisco, patented (US patent 249606) a keyboard adding machine (see the lower patent drawing). 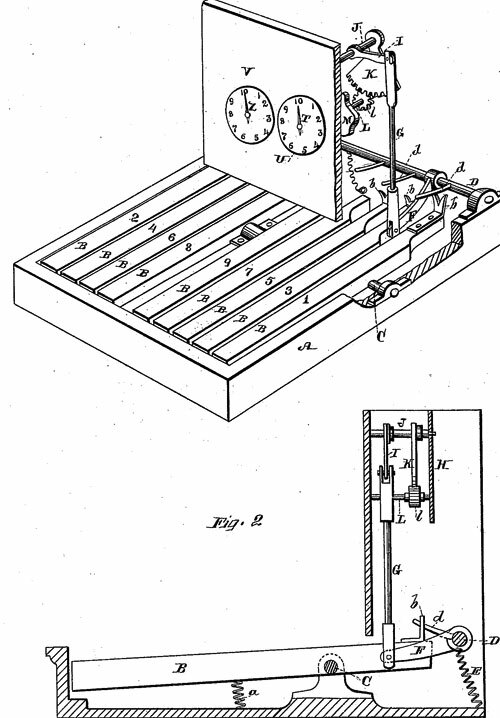 The device has dial-plates and indicators adapted to be moved by clock mechanism and an escapement, an oscillating plate M, with a groove m for releasing said escapement, in combination with the means for oscillating said plate, consisting of the pinion l, segment K, crank I, upright rod G, crank F, rocking shaft D, with its pins d, and removable keys B, with their adjusted lifters b.
Peter C. Forrester's adding machine (the patent drawing). In short columns of numbers the device is not as useful as in long ones. When the latter have to be added the time taken in turning the dials after each row is not noticeable. Not much is known about the inventor—Peter C. Forrester. Born in Detroit, Michigan, in 1858, Peter C. Forrester was a prolific inventor and businessman, the author of many (at least 10) US patents for various inventions like: method of mining coal (US patent 473734), scroll former (US543233), tool for binding metal strips (US543234), drill (US628404), and others. He was married to Bessie Lynette Forrester (born Toner) (1872-1925) from Detroit, Michigan. Peter C. Forrester died on 5 July, 1952, in Tacoma, Washington, at the age of 94.